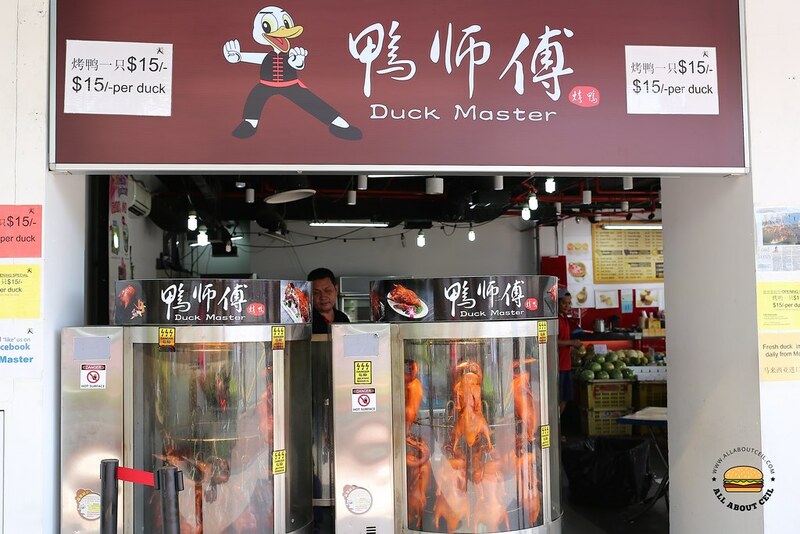 ALL ABOUT CEIL: Duck Master : $15 per duck is just so cheap! They first started on the ground floor of People's Park Complex in June 2017 before expanding to include this outlet at Textile Centre, along Jalan Sultan. Their mascot is a Donald Duck in a kung-fu gear and it is hard to miss. And, their tempered glass electric roasting ovens with rows of ducks spinning as they roast are definitely eye-catching. 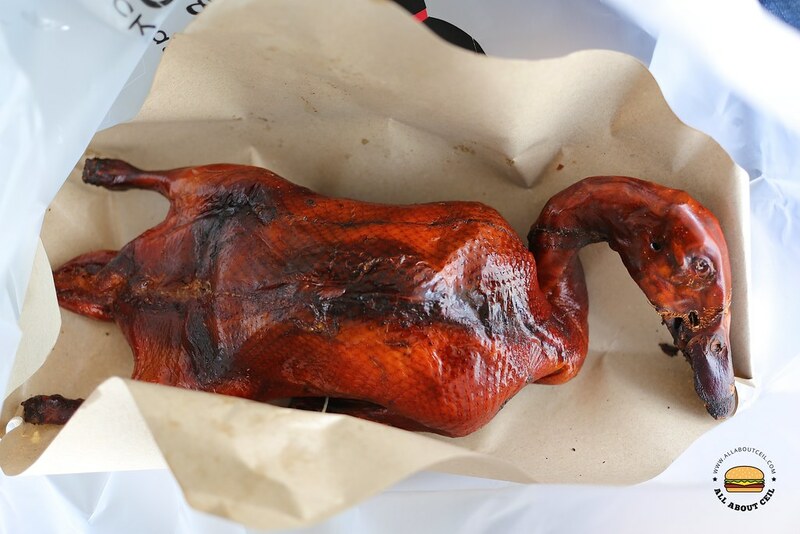 These roasted ducks are going at an unbeatable price tag of just $15 each and this caused quite a lot of stir on Social Media that led to really long queue and waiting time. Customers have to place their orders first, a token is issued to come back later for collection. They started roasting at about 10 am when they open and a few hundreds of ducks are prepared in several batches of 24 ducks in each rotisserie. It takes about 45 minutes for the ducks to be cooked in the 100-degree Celsius oven and turns up the heat for an additional 15 minutes to achieve the desired crispiness for the skin. Paul Boh, 30, the owner, who is a former food photographer, picked up the skill from his mother about 8 months ago. He experimented with the roasting temperature and speed of the rotation of oven to ensure the even distribution of the heart prior to the opening of his stall. He also learned how to use those pre-set function to roast those ducks. The ducks might not be as flavorful as compared to those cooked in the charcoal-fired oven but the marination process that involved the using of 11 spices like cinnamon and star anise in their central kitchen has definitely made up for it. Fresh ducks are sourced from Malaysia and roasted within 24 hours after they are slaughtered and delivered to their stores. Each cooked duck is weighed between 1.8 to 2 kg and at $15, it is affordable and much cheaper than most of those sold in the hawker centres. Using the electric-powdered rotisseries is more cost-effective as compared to the usual charcoal-fired or gas-powdered metal ovens that are most commonly used, new technology is definitely a good way to cut down on operational costs. The duck is sold in whole as they do not provide chopping service, this is also to keep its moistness and preventing its juiciness from escaping. Another reason is to save on its manpower costs to keep the costs of ducks low. I went on a weekday to take away 1 duck at their outlet in Textile Centre and there was no queue. I was told that it is usually quieter here as compared to their main outlet at People's Park Centre as the parking is an issue over here. The duck was still warm when I got home, though it was smaller in size, its meat was unbelievably tender and quite tasty though a little too saltier, the marinade was rather light with a tinge of spices. The paper-thin skin was crispy and surprisingly not greasy, unlike the other roasted ducks that I had tasted, it is good to eat on its own and even without the accompanying chili sauce. Currently, there is also an online ordering system to place orders in advance and collecting at a specific timing of your choice at their outlets.